Here for sale a Stunning Stylish Ring of Unusual Design: Natural Real Solitare Diamond in 18 carats 750 White Gold Ring with Certificate. Fully Hallmarked. It is not gold plated or cheap rolled gold. 9ct White gold. Ring is UK Hallmarked for solid 9ct Gold. Diamond Ring. Size L (uk) - 5 1/2 ( usa) Ring sizing details Below . Ring sizing service available, at cost price of £23.50. Diamond has been tested to confirm it is natural. PLATINUM 950. 26ct DIAMOND SOLITAIRE RING. The Forever Diamond is exclusive to H.Samuel and forms the breathtaking centrepiece in a collection of diamond rings and jewellery. This unique flower cut features 73 beautifully proportion facets, which is 15 more than the average brilliant cut diamond. A SUPER 2 CWT'S! Stone Carat: 2 CWT. VALENTINES PRICE CRASH £175.99 FROM £215.99 £40.00 0FF. THIS RING CAN BE PROVIDED IN SILVER, 10,14,18,24 K WHITE OR YELLOW GOLD. CAN ALSO PROVIDE A RANGE OF DIAMONDS FROM BLACK, WHITE, BLUE, COGNAC ETC. Fabulous Certificated 18ct White Gold 52pt Diamond Solitaire Ring. Set With a 52pt Round Brilliant Cut Diamond. Certificated By Anchorcert at Birmingham Assay Office. Full UK Hallmarks. Ring Size M. Weight 3.5 Grams. 18ct Yellow gold. Ring is marked for solid 18ct Gold. Diamond ring. Size L (uk) - 5 1/2 ( usa) Ring sizing details Below . Ring sizing service available, at cost price of £20.00. -Established family run jewellers with over 12 years of Experience. External Characteristics ~ Knife Edge Girdle, high crown and a small table. Internal Characteristics Very small crystalline diamond feather. Simply gorgeous Old mine cushion cut diamond. Colour ~ G (near colourless matched with a set of colour grading stones under a GIA light box). The 4mm diamond is a 1/5 carat round brilliant cut stone, natural, earth mined and untreated NOT LAB CREATED ! The gem is clean to the naked eye, no visible carbon spots or clouding. This fine ring is crafted from solid, durable 9carat white gold with full UK assay marks. Stunning 18ct gold 1.2ct Old Cut diamond solitaire ring - HUGE INVESTMENT RING! The GIA calculations for Old cut stones is length x width x depth x 0.0066 (this factor is 0.0061 for modern brilliant cut stones ). Cut by hand and without the aid of modern machinery each Old cut diamond has its own individual charm and character. This is another very substantial quality ring which can't be appreciated in the photos ! FOR INFORMATION : WHITE GOLD V. YELLOW GOLD V. PLATINUM. SIMILARLY ALTHOUGH PLATINUM IS POPULAR, EVEN THOUGH EXPENSIVE, PLATINUM DOES LOSE ITS SHINE QUITE QUICKLY AFTER WEARING REGULARLY AND CAN ACTUALLY LOOK QUITE DULL. Ring is UK Hallmarked for solid 18ct Gold. Diamond 0.76CT ring. Size P (uk) - 7 1/2 ( usa) Ring sizing details Below . Ring sizing service available, at cost price of £22.00. Diamond is SI/2 clarity, nice clean stone with a good flash. Fully Hallmarked-950 Platinum. Total gem weight-1.000cts. A real winner! Size N 1/2. The band is thicker at the back giving a gorgeous feel to the ring when worn, and obviously it will sit perfectly with your choice of wedding band. I have for sale a lovely diamond ring set in 18ct white carat gold. The gold is white and the shank is nice and round. There is the usual ware for a used ring. Stunning 18ct gold 1.8ct Victorian Old Mine Cut diamond cluster ring INVESTMENT! The GIA calculations for Old Mine cut stones is length x width x depth x 0.0077 (this factor is 0.0061 for modern brilliant cut stones ). The ring is mounted with 19 Old mine cut diamonds weighing approx 1.80ct. 9ct White gold. Ring is UK Hallmarked for solid 9ct Gold. Diamond Ring. Size N (uk) - 6 1/2 ( usa) Ring sizing details Below . Ring sizing service available, at cost price of £23.50. Diamond has been tested to confirm it is natural. Total solitaire diamond weight - 0.55 carats. 0 55 ct vs D White gold - YouTube. Paste link into a browser window:[isdntekvideo]. This is precious jewellery at a bargain. I am clearing off my personal collection. 9ct Yellow Gold. Ring is UK Hallmarked for solid 9ct Gold. Diamond Ring. Size J (uk) - 4 5/8 ( usa) Ring sizing details Below . Ring sizing service available, at cost price of £19.50. Diamond has been tested to confirm it is natural. Garys personally note: This ring cost Emma's ex over £3k 7 years ago and its been sat in a drawer ever since, my advice is do NOT get married and keep your money, seriouly, if marrage were a horse no sane man would ever bet it, best off shooting it! THE DIAMOND IS BRILLIANT CUT AND OF GOOD CLARITY AND COLOUR G GRADE VSI1. 18ct GOLD. 20ct DIAMOND SOLITAIRE RING. THE RING IS FULLY HALL MARKED 18ct. THE GOLD SHANK TAPPERS TO THE CENTER STONE. Stunning Quality Diamond Ring 18ct White Gold Ring Size O US 7 Single diamond with a small diamond on each side. Really good quality white, bright clear diamond. Large diamond is approx 3mm or 0.25 carat at a guess. Absolutely beautiful. Comes boxed but not the original. Weighs 5.5g of 18ct white gold. I am also selling a diamond 18ct white gold wedding ring to match , so please check my other listings. A beautiful 18ct brilliant cut 0.35ct diamond single-stone engagement ring. Item has full UK Hallmarks for solid 18ct Gold (750). H-I colour. Estimated diamond weight 0.35ct. Size P (uk) - 71/2 (usa) Ring sizing details Below . International Ring Size Table. Total Weight (grams) - 2.2 grams. 18ct White Gold. Excellent condition - Ring is stamped for solid 18ct Gold. Diamond ring. Size L (uk) - 5 1/2 ( usa) Ring sizing details Below . Ring sizing service available, from £23.50. Diamond is of excellent quality & has been tested to confirm it is natural. Here for sale, we have this magnificent ladies ring. Four princess-cut diamonds flanked by four brilliant cut diamonds set in either shoulder on a lovely 18ct white gold shank. This ring would make an ideal gift for a loved one. Diamond Carat : 0.70 Carat. Diamond Shape : Princess. Hatton Garden Jewellery Quarter, London. This ring is also available in Platinum, 18K White, Yellow and Rose Gold. DIAMOND JEWELLERY. Diamond Clarity : SI. 18ct Yellow gold. Diamond ring. Size J (uk) - 4 5/8 ( usa) Ring sizing details Below . Ring sizing service available, at cost price of £20.00. Diamond is of outstanding quality & has been tested to confirm it is natural. Dubai Gems [DG] GIA Certified Diamonds Collection; GIA is the world's leading diamond laboratory, grading diamond characteristics with the highest standards of integrity and professionalism. Each GIA diamond, unique in its characteristics and grading values, is individually certified and the certification number can be identified on the GIA Official Website. This ring is made up of 950 platinum. This ring is in fantastic condition. Light signs of use can be seen but under close inspection only. Four small princess cut diamonds adding up to a 0.25TCW are held in place securely and firmly with no signs of looseness. Excellent condition - Ring is UK Hallmarked for solid 18ct Gold. Diamond 0.15CT ring. Size K (uk) - 5 1/8 ( usa) Ring sizing details Below . Ring sizing service available, at cost price of £22.00. Diamond is of excellent quality & has been tested to confirm it is natural. 18ct Yellow gold. Ring is UK Hallmarked for solid 18ct Gold. Diamond ring. Size M (uk) - 6 ( usa) Ring sizing details Below . Ring sizing service available, at cost price of £20.00. Diamond is of outstanding quality & has been tested to confirm it is natural. Even through my jewellers' loop I can see no inclusions - A beautifully white and very shiny Diamond. THIS RING LOOKS NEW! Very Small Size J. The design is gorgeous - a twist style band with a sparkling marquise shaped yellow diamond which catches the light beautifully! The diamond in this ring is stunning, approximate clarity VS1 and 1/4 of a carat of diamond. Excellent condition - Ring is UK Hallmarked for solid 18ct Gold. Diamond 0.15CT ring. Size L (uk) - 5 1/2 ( usa) Ring sizing details Below . Ring sizing service available, from £23.50. Diamond is of excellent quality & has been tested to confirm it is natural. Fabulous Marquise Diamond Ring, 0.42 Carats in total. The Diamond is Grade E and Vs1 as shown on pictures with certificate. The band is solid 18ct white gold. Size L and can be sized. A SUPER 0.50 CWT'S! GENUINE EARTH MINED BLUE DIAMOND RING. 10K SOLID HALLMARKED WHITE GOLD. THIS RING CAN BE PROVIDED IN SILVER, 1/14,18,24 K WHITE OR YELLOW GOLD. CAN ALSO PROVIDE A RANGE OF DIAMONDS FROM BLACK, WHITE, BLUE, COGNAC ETC. 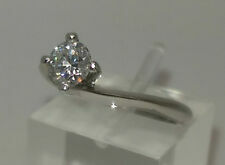 Stunning Diamond Solitaire Ring, .85ct SI2 H, 18ct Gold, Size M, UK Hallmark. Stunning diamond solitaire ring, set in 18ct yellow and white gold. The shank is 18ct yellow gold, size M. The clasp is 18ct white gold, securely holding the diamond in an eight prong setting. The diamond itself is stunning, estimated clarity SI2, colour H.
Diamond Shape : Round Brilliant Setting Type : Claw Setting. Hatton Garden Jewellery Quarter, London. This ring is also available in Platinum, 18K White, Yellow and Rose Gold. Diamond Carat : 1.00 Carat Ring Size : M.
18ct Yellow Gold. Diamond Ring. Size L (uk) - 5 1/2 ( usa) Ring sizing details Below . Ring sizing service available, at cost price of £19.50. Diamond has been tested to confirm it is natural. -Established family run jewellers with over 12 years of Experience.